The New Humanitarian | More aid agencies under "investigation"
More aid agencies under "investigation"
More relief organisations are threatened with expulsion from Sudan, officials warned, as "investigations" continue into the activities of those suspected of collaborating with the International Criminal Court (ICC). "The process continues," the head of the government Humanitarian Affairs Commission Hassabo Mohammed Abdel Rahman warned. "More NGOs are under focus and investigation. If we find evidence, we will expel them." Sudan has so far ordered 13 NGOs to leave, saying they provided information to the world court before it issued an arrest warrant for President Omar el-Bashir on war crimes charges. "The decision by the government of Sudan to expel 13 NGOs involved in aid operations in Darfur will, if implemented, could cause irrevocable damage to humanitarian operations there," UN Secretary-General Ban Ki-moon warned. 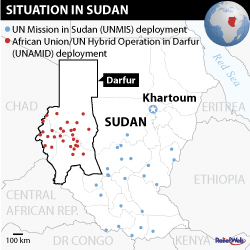 These operations, according to the UN, were key to maintaining a lifeline to 4.7 million people in the western region of Darfur. About 300,000 people have died there, either in direct combat or due to disease, malnutrition or reduced life expectancy over the past five years. Bashir denies the ICC charges, describing them as a plot of western "neo-colonialism". His supporters came out in large numbers in the capital, Khartoum, on 5 March to protest. Rahman did not name any specific NGO, but said the organisations being probed worked not only in Darfur, but "all over Sudan". The fresh expulsion threat came despite growing international pressure – including from the European Commission and US - on Sudan to allow the expelled groups back in. Campaign group Amnesty International warned that 2.2 million lives were at stake. The people in the western region of Darfur were "being punished by its own government in response to the arrest warrant", it added. The removal of key agencies would be a severe blow to the poorest, especially in Darfur where violence continues to affect large numbers of civilians, observers said. "The Sudanese authorities must immediately reverse their decision," Amnesty's deputy director for Africa, Tawanda Hondora, said. "The alternative is simply unthinkable." Ten NGOS were expelled on 5 March, and three more the next day. These included Oxfam, CARE, MSF-Netherlands, Mercy Corps, Save the Children, the Norwegian Refugee Council, the International Rescue Committee, Action contre la faim, Solidarités and CHF International. Some of them were asked to turn over a list of their assets and banking details, while others had their computers, communications equipment and vehicles confiscated, according to Catherine Bragg, the UN Deputy Emergency Relief Coordinator. While some international staff were given only 24 hours to leave Sudan, others were detained for a few hours, then released. "They cooperated with the ICC - some sent fabricated [information] to the ICC about genocide," Rahman said. The expelled aid groups have rejected the accusations. Oxfam, in a statement, said it "does not have an opinion on the [ICC's] activities, and our sole focus is meeting humanitarian and development needs in Sudan". 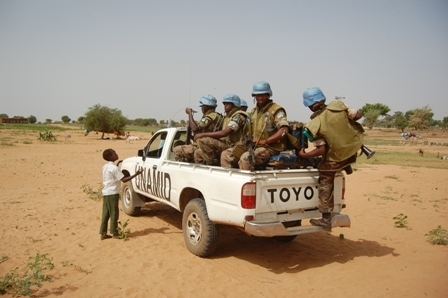 A UNAMID convoy patrols through Dali village in North Darfur. September 2008. Rebel groups in Darfur were angered by the expulsions and have demanded they be reversed. "The people of Darfur are already hungry - and now the government wants to take their food away," said Maghoub Hussein, a spokesman for the Unity faction of the Sudan Liberation Army. "This is the government wanting to make the people suffer more, and they must be made to stop." Between 200 and 300 international staff are believed to employed by the organisations ordered to leave. A total of around 16,000 aid workers operate in Darfur, some 95 percent of whom are Sudanese. Ban pledged that the UN's humanitarian and peacekeeping operations, with some 25,000 personnel in Sudan, would continue.